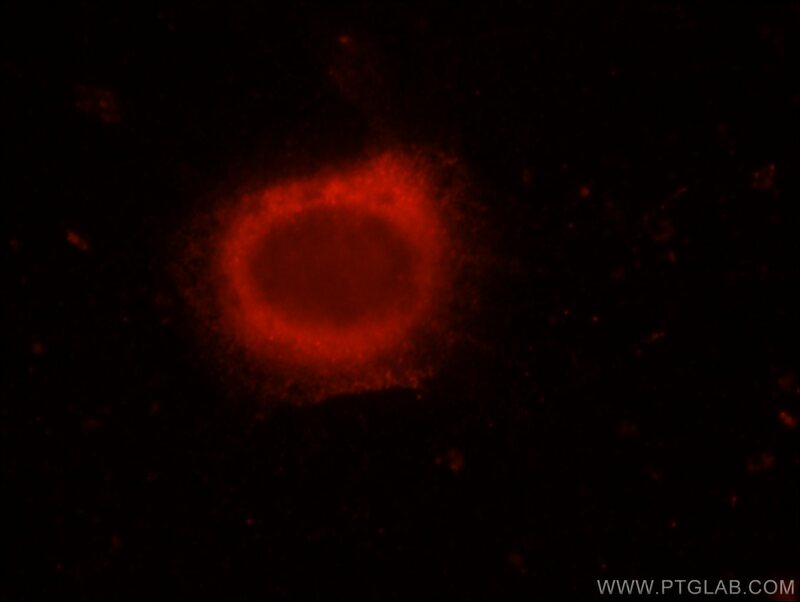 Immunofluorescent analysis of MCF-7 cells, using ERC1 antibody 22211-1-AP at 1:50 dilution and Rhodamine-labeled goat anti-rabbit IgG (red). ERC is an acronym based on previous separate namings of members of this protein family, ELKS, Rab6IP2 and CAST (PMID: 12391317). They are known to bind RIMs, the active zone proteins that regulate neurotransmitter release. ERC1 (ELKS) is an essential regulatory subunit of the IKK complex and likely functions by recruiting IκBα to the complex (PMID: 15218148). Multiple isoforms of ERC1 mRNA are generated by alternative splicing (PMID: 12203787). There are two known splice variants of ERC1 protein that differ at their C termini, ERC1a and ERC1b. ERC1a is ubiquitously expressed, whereas ERC1b is brain-specific (PMID: 12391317; 12923177). MICAL3 flavoprotein monooxygenase forms a complex with centralspindlin and regulates cytokinesis. Facilitating identification of minimal protein binding domains by cross-linking mass spectrometry.